Today, Microsoft released Windows 10 build 17093 to Insiders on the Fast ring, making it the first new build since 17083 was released two weeks ago. 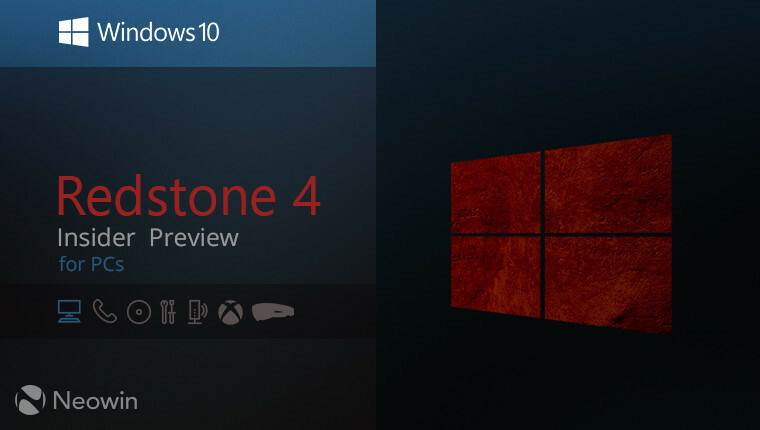 It's the latest preview from the Redstone 4 branch, which will eventually become the next feature update to Windows 10. In fact, Microsoft should be putting the final touches on what will be version 1803 soon. Insiders will probably see an RTM build next month, with a release for the public the month after that. Quests from the Bug Bash indicate that it will be called the Spring Creators Update, although Microsoft hasn't announced that officially. We’ve given Game bar a makeover so it’s even easier to find what you’re looking for. Go to your captures, toggle your microphone and camera, and edit the title of your Mixer stream—all from new buttons on Game bar. Quickly check the time using the new clock. Choose a theme—Dark, Light, or your current Windows theme. Game bar settings are easier to use. 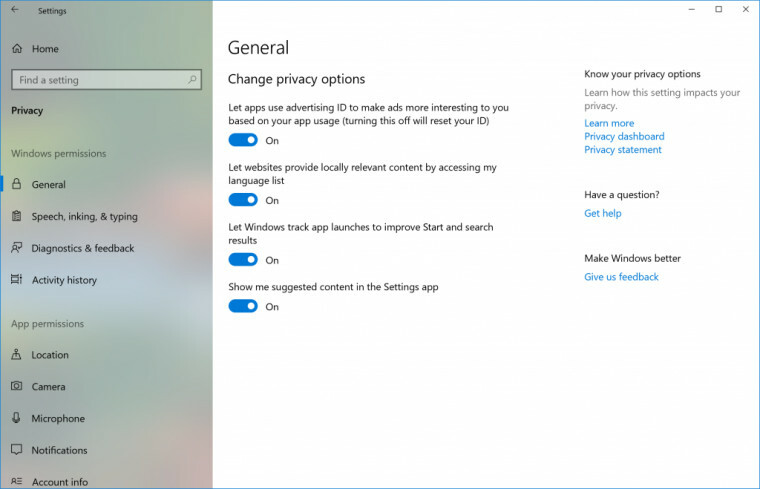 Last week, we announced some new privacy tools as part of Data Privacy Day which included the Diagnostic Data Viewer that showed up for Windows Insiders in Build 17083. With our commitment to transparency and control, users can now delete the Windows Diagnostic Data that Microsoft has collected from your device. 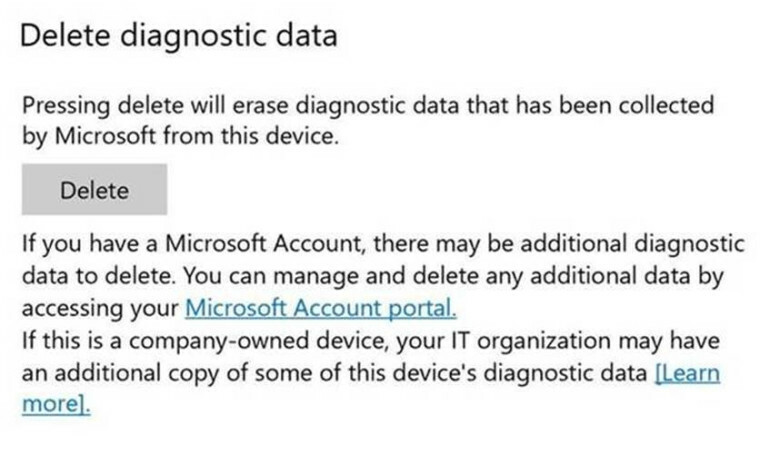 In Settings > Privacy > Diagnostics & feedback, you will find a delete button that deletes the Windows diagnostic data associated with your device. 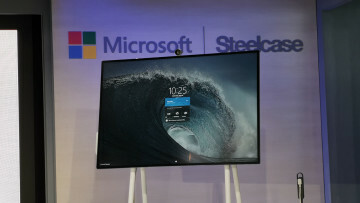 HDR Video on more Windows PCs: Many newer devices are capable of HDR video, but needed to be calibrated in the factory to enable HDR. 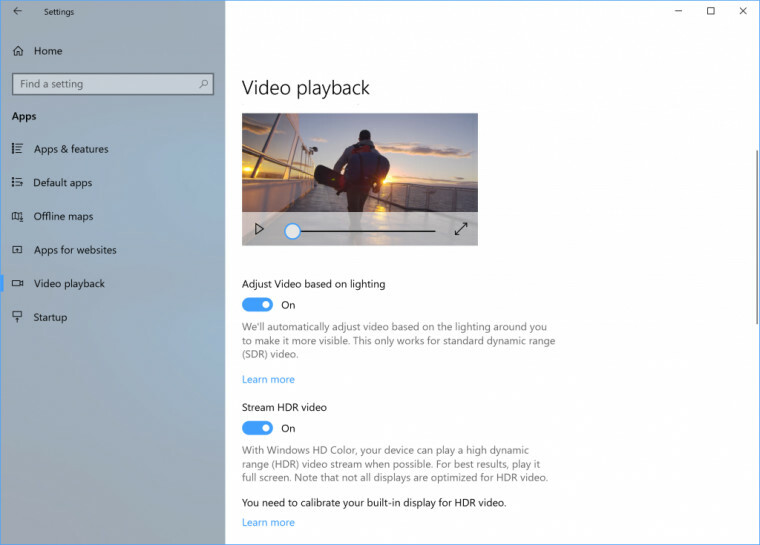 Now, we are expanding HDR video access to more users via new functionality via Settings > Apps > Video playback. If the “Stream HDR video” toggle can be switched to “On”, your device can be calibrated for HDR video. To try our experimental calibration tool, click the link “Change calibration settings for HDR video on my built-in display”. This allows you to change the way HDR video appears on your device, allowing you to find your preferred balance between details in dark scenes and details in bright scenes. This tool is still early stage, and we’d love any feedback you might have as we are getting this tool ready for release with RS4. The first step is to choose an application to configure. Choosing a “Classic app” will let you browse to an application on your system. Choosing a “Universal app” will let you choose a Store application from a list. 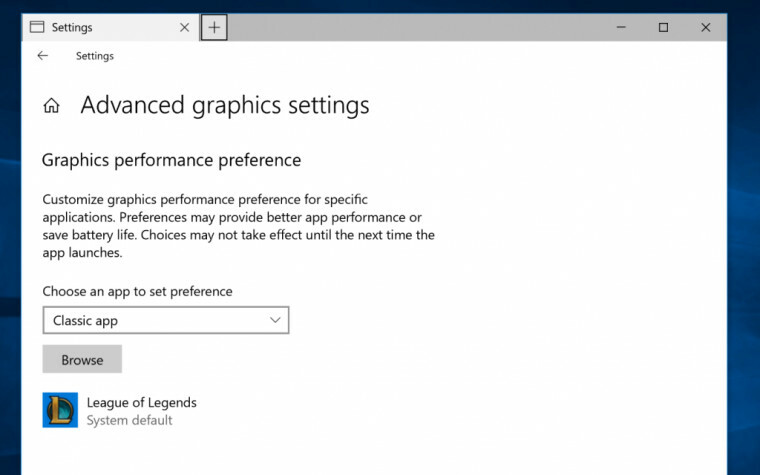 By default, the application added to the Graphics settings page is given a “System default” preference. System default means that the system decides the best GPU for your application. Once you’ve chosen the application, click on the application in the list and then click the “Options” button. The “Power saving” mode is a request to run the application on the most power saving GPU available. 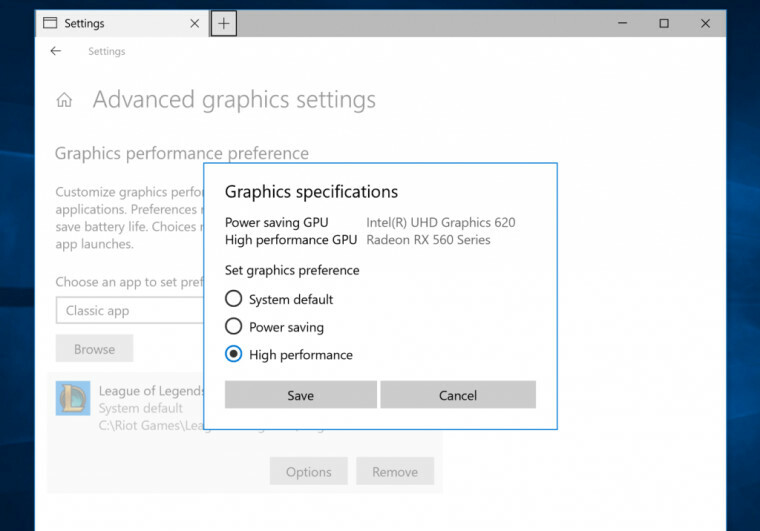 The “High performance” mode is a request to run the application on the most high performance GPU available. Generally, the power saving GPU is the integrated GPU on a system, and the high performance GPU is the discrete GPU or external GPU. If you have both a discrete GPU and an external GPU on a system, the external GPU is considered the high performance GPU. Remove an application from the list by clicking the application and clicking the “Remove” button. Removing an application is the same as choosing “System default”. Applications are always allowed to have the ultimate choice of which GPU to use, so you may see additional applications that do not follow the preferences you set. In that case, look for a setting within the application itself to choose a preference. If you have feedback about the feature, please reach out to us directly on the Feedback Hub. 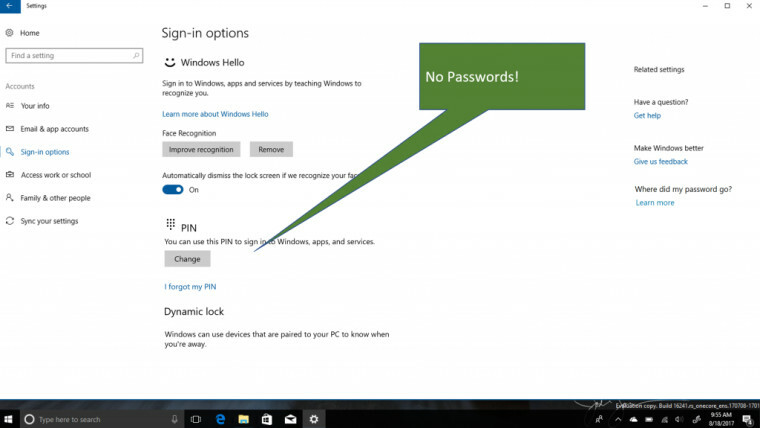 Go password-less with Windows 10 S! Do you hate entering your passwords all the time? So do we. Passwords are inconvenient and insecure. 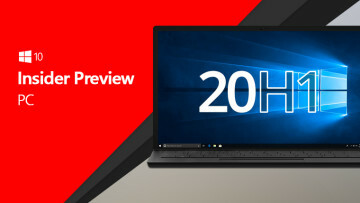 With Windows 10 S you don’t have to! Just download the Authenticator App and use it to set up your Windows 10 S PC. 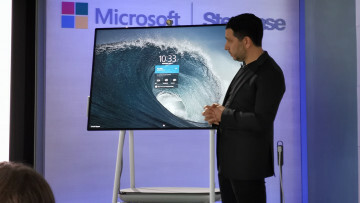 You will be able to go through the out-of-box experience, set up Windows Hello and access all your favorite apps and services – all without ever having to enter your password. With the changes in this build, your Windows 10 S PC will automatically make your experience password-free. 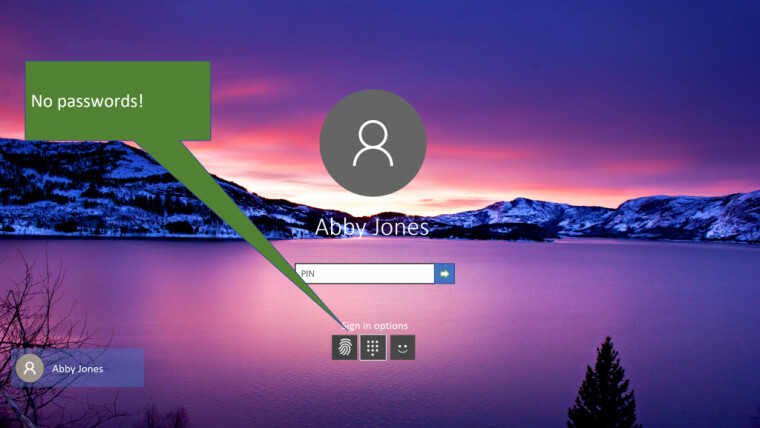 You will notice that if you have Windows Hello set up, you won’t see passwords anywhere in the Windows experience – not on the unlock screen nor in Sign-in options. Navigate more easily: We’re adding the ability to more easily scroll content, like email and websites. We also heard the need for a quicker way to click with the mouse, so in addition to precise mouse control we’ve incorporated direct left click and direct right click capabilities into the launchpad. Get there quick: Accelerate to common tasks with quick access to Start, Timeline, Settings, and device calibration, now available right from the eye control launchpad. Pause when you need to: We also received feedback on the importance of pausing or hiding the launchpad when not needed to avoid accidental clicks, so we’ve added a pause button on the launchpad. Eye control users now have the flexibility to hide the launchpad for uninterrupted reading, streaming, or relaxing without accidental clicking. Re-engaging the launchpad is simple too – just glance at the pause button in the top or bottom middle of the screen. Eye control is still in preview, and we welcome your feedback to help improve the experience! 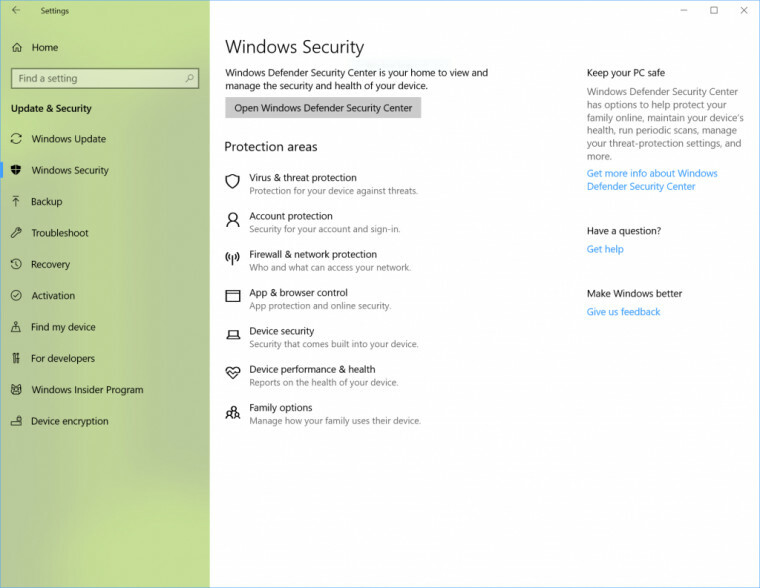 Windows Defender is now Windows Security in Settings: We have renamed the settings page under Settings > Update & Security from “Windows Defender” to “Windows Security. This settings page has also been redesigned – putting emphasis on the various protection areas to keep you safe and secure on your PC. 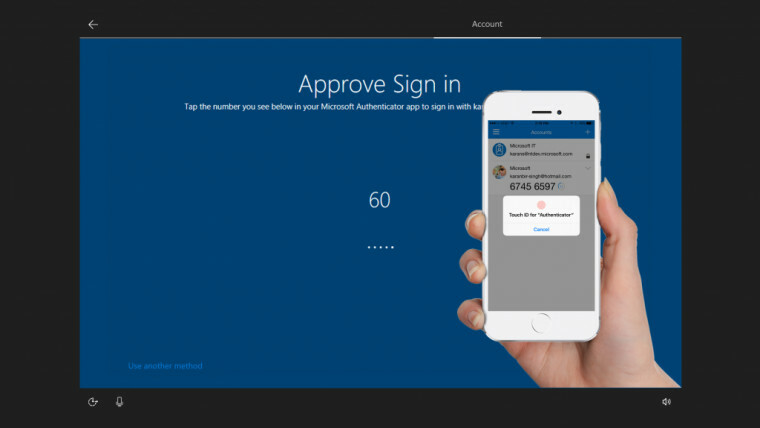 Account Protection Pillar in Windows Defender: We’ve made it easier for users to protect their identity when signing in to Windows with the new Account Protection pillar in Windows Defender Security Center. Account Protection will encourage password users to set up Windows Hello Face, Fingerprint or PIN for faster sign in, and will notify Dynamic lock users if Dynamic lock has stopped working because their phone or device Bluetooth is off. Device Security Pillar in Windows Defender: We’re giving you greater insight into the security features integrated in your Windows device. 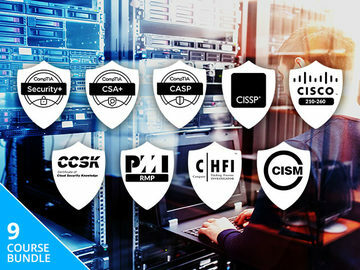 The Device Security page provides you with status reporting and management of security features built into your devices – including toggling features on to provide enhanced protections. 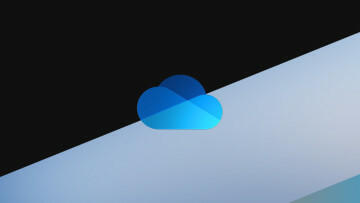 Streamlined Pairing and Connecting to Certain Bluetooth Devices: Starting with this build, Windows enables users to start pairing and connecting supported devices in a single click. When these devices are ready to pair and detected to be in range, Windows shows a notification to the user allowing them to quickly and conveniently start the pairing process. We want to thank the Surface Accessories team for partnering closely with us and having the first device available on the market supporting this great new experience, the Surface Precision Mouse. We are working with many other partners to grow the list of supported devices, and a number of them are on the way. To learn more, check out our blog post here. Evolving full screen mode (F11): With the Fall Creators Update we added F11 support to Microsoft Edge, to enable you to take full advantage of your screen real estate. Full screen removes the Edge frame so that only the webpage is visible. You can enter this mode by pressing the F11 key, and exiting using the same key. We’ve heard your feedback, and with this build we’re updating this experience so that without leaving full screen you can now access the address bar and navigate to other sites, add a site as a favorite, and more. To do this, simply hover your mouse at the top of the screen while in full screen mode, or using touch drag a finger down from the top of the screen, and the familiar controls will appear. As always, don’t hesitate to provide feedback so we can continue improving this feature. 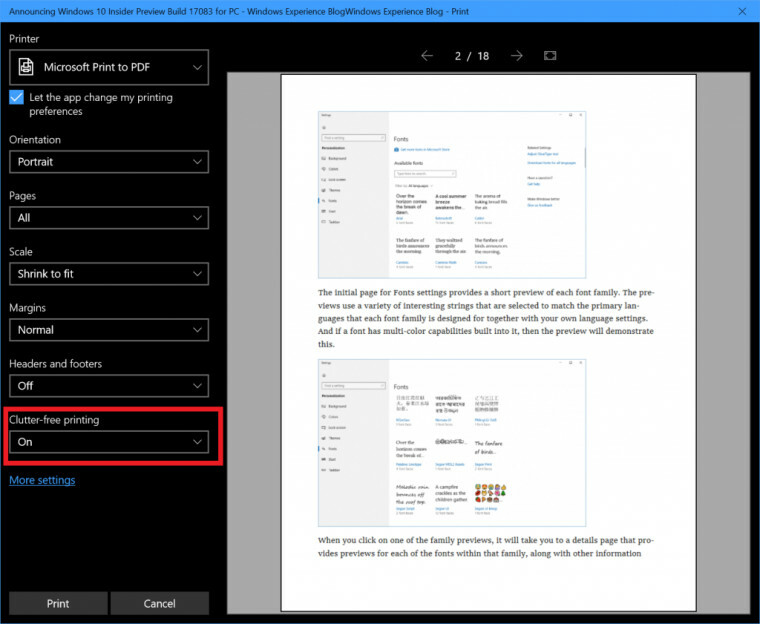 Clutter-free printing: Now you can print webpages from Microsoft Edge without ads and unnecessary clutter from the web. Enable the “Clutter-free printing” option in the print dialog and print only the content you want. Note: this option will only be visible for certain type of webpages. Multilingual text support in Windows: If you type in more than one Latin script languages on Windows, you’re going to like this new feature. With the Touch Keyboard, you do NOT have to manually switch the language anymore! Simply continue typing in multiple languages and Windows will assist you by showing predictions from multiple languages to make you more productive. The additional step of manually switching between languages creates a barrier for users that are multi-lingual. We’re hoping that this feature can reduce that barrier and allow you to easily type in multiple languages. With this build, Windows supports up to 3 Latin script languages for multi-lingual text predictions. It picks the top 3 installed languages from Language Settings while suggesting predictions. You can turn the feature off by going to Settings > Devices > Typing > Multilingual Text Prediction. Text Prediction support for a bunch more languages! If you’re using the touch keyboard in any of the following languages, you’ll now see words suggested as you type: Assamese, Bashkir, Belarusian, Greenlandic, Hawaiian, Icelandic, Igbo, Irish, Kyrgyz, Luxembourgish, Maltese, Maori, Mongolian, Nepali, Pashto, Sakha, Tajik, Tatar, Tswana, Turkmen, Urdu, Uyghur, Welsh, Xhosa, Yoruba, Zulu. View user dictionary: We’ve added a new section to Speech, Inking, & Typing settings under Privacy so that you can new view your user dictionary and easily clear it if need be. Narrator has been enabled in safe mode: You can now use Narrator when in safe mode! Note: It’s recommended for Narrator users to enter safe mode via msconfig.exe. On some devices you may need to use USB headphones to hear audio in safe mode. Note about launch speed: The first launch of each distro will be slow on this build. Some of our updates require sizeable changes to the Linux file system directories; applying those changes may take a few minutes. This should only happen once for each distribution you have installed from the store. WSL is more configurable with wsl.conf: We added a method for you to automatically configure certain functionality in WSL that will be applied every time you launch the subsystem. This includes automount options and network configuration. Learn more about it in our blog post. AF_UNIX allows socket connections between Linux processes on WSL and Windows native processes: WSL and Windows applications can now communicate with each other over Unix sockets. Imagine you want to run a service in Windows and make it available to both Windows and WSL apps. Now, that’s possible with Unix sockets. Read more in our blog post. Better file handling via folder level case sensitivity: One of the tricky problems sharing data between Linux and Windows comes down to file case handling. Windows isn’t case sensitive, Linux is. 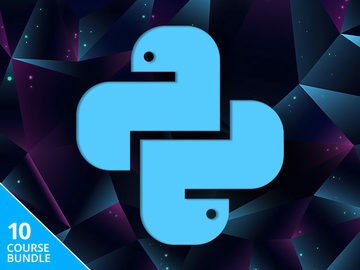 In the past WSL used exclusively process-based case sensitivity. Starting in 17089, NTFS has a new flag that can be set on directories to indicate all operations in those directories should be treated as case sensitive, which allows Windows applications to correctly open files that differ only by case. This is the fourth major release that we've seen in a row, with another long list of new features. One would assume that Microsoft will begin to wind down pretty soon, with RTM little over a month away.